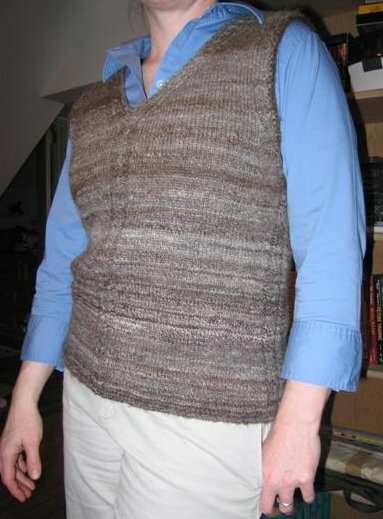 Would you believe, I finally finished my handspun, designed-on-the-fly sweater vest! Yes, indeed. Actually, I had 99.5% of the knitting a couple of weeks ago, but it was the finishing that held me up in calling it “done”. Yes, they are fraternal, though some of the differences are subtle (cable directions and such). I might never do identical socks again! 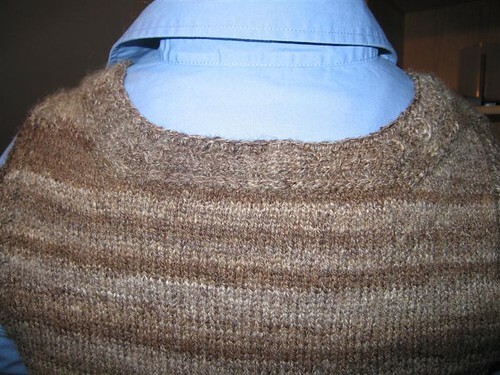 This is a great way to use up odd partial-skeins. Shetland, Corriedale and Romney, in a beautiful range of natural colors to add to the stash. And so, now the question is- what’s next? Hats for next Christmas? Another sweater for The Man? a boatload of socks? Whatcha think? I’m thinking I might soon offer some of my handspun on Etsy.com , as I am spinning faster than I am knitting these days. The plan is that yarn proceeds would go into Denise’s Sheep Fund, to help support the work necessary to make our homestead “sheep-ready”. So maybe that is the next big project- getting myself organized. Oh, to knit OR spin quickly! But I enjoy both, so I guess that’s what matters.